For profound, influential, and lasting contributions to the design of practical high-level programming systems, notably through his work on FORTRAN, and for seminal publication of formal procedures for the specification of programming languages. John Backus died at his home in Ashland, Oregon, March 17, 2007. Hi John, it's great to make contact with you. Ever since I came to work in what we still call Watson Lab, you have been the local hero. I first encountered computing and Fortran in 1965 in the Army, and had arrived at Columbia by 1966 (when IBM was still here, in the very building I'm sitting in right now, but I didn't know it at the time). In those days, Watson Lab was still littered with plugboards, card decks, and little wires. I still have somebody's 1940s Steelcase desk and a pile of EAM manuals (my first "programming" experience was on the 407). which, as I guess you have seen, can be followed through endless links to sub-pages on people, equipment, and events, plus several online books and papers. I started working on this when I discovered I had become (almost) the oldest guy around here, and everybody's favorite source for nostalgia. Once I started writing, however, I became far more interested in the Eckert and Watson Lab eras than in whatever I remember first-hand. Especially once I started receiving calls and emails from veterans of those years, including Herb Grosch, Eric Hankam, Ellie Krawitz, Ken Schreiner, and Seymour Koenig, all of whom you probably remember (and most reachable by email), as well as many others from the years after you left. Eric still lives in the same apartment, right around the corner. Ellie is at NYU. Herb is at the University of Toronto. e.g. Hollerith (and soon Eckert) as "Columbians Ahead of Their Time", as well as into the commemorative volume ("Stand Columbia"). before C250 goes public with it. Even though this stuff has little to do with Columbia, beyond the Eckert connection, I find the War years fascinating, probably because both my parents were in the War so I grew up with it. I even have a little library of wartime Air Almanacs on my bookshelf! You went to the University of Virginia, but left early and joined the Army. Me too (I don't know what UVA was like when you were there but in the early 1960s, all anybody did was drink themselves into a stupor). You had some technical training in the Army; me too (it's where I learned key-punching, board wiring, etc, and first saw Fortran and the *mobile* IBM 1410, where it was used for programming the very first "command and control information systems" -- if that was good or bad I don't know but it's history). You went to Columbia after the Army -- me too (General Studies), on what was left of the GI Bill. You received Bachelors and Masters degrees at Columbia? (Me too) Some of the courses I took in EE (we didn't have a CS department yet) were the same ones originated by Herb Grosch and Wallace Eckert (e.g. Numerical Methods), then still taught by ex-Watson Labbers. but it seems the only way to access it is in person. I apologize for not responding to your earlier email, but I received it the day my wife died and things have been in a turmoil since then. I'm still very busy working to edit & publish the not-quite-finished book she'd been working on for the last seven years. I've explored only a little of the vast material you present online, but what I've seen is fascinating. It's truly amazing how you've managed to capture so many little details. I could spend forever following the intriguing links you provide. It is amazing how our early paths coincided. And it was true when I was there, too, that all anyone seemed to do at UVA was drink themselves silly. I hope you didn't flunk out like I did! My "career" at Columbia was also financed by the GI bill. I was majoring in math. I spent very little time at Watson Lab. But remember my stint on the SSEC fondly. (although I think it's an extreme stretch to consider it the first "stored program" computer--even though one of the programs I did used some specially prepared storage cells as the source of an instruction after some data was stored in it.) Hope I can be of some help. There's so much to say, and so little time, it's probably easier if we talk on the phone. What's a good time to call? I apologize for not responding to your earlier email, but I received it the day my wife died and things have been in a turmoil since then. That's just about the worst thing I can imagine, I'm so sorry. Next to that, computer nostalgia is inconsequential. I'm still very busy working to edit & publish the not-quite-finished book she'd been working on for the last seven years. That must be hard. Can I ask what it's about? Thanks, it's a labor of love -- I confess some degree of nostalgia for the days when computers were designed and used by scientists to solve serious problems, compared to today, when they are mainly home entertainment and shopping devices. It is amazing how our early paths coincided. And it was true when I was there, too, that all anyone seemed to do at UVA was drink themselves silly. I hope you didn't flunk out like I did! My "career" at Columbia was also financed by the GI bill. I was majoring in math. The GI Bill was a wonderful thing. Without it, I don't know what my parents would have done after the War. I majored in Sociology, of all things, and soon discovered nobody will pay you to save the world, so wound up (after taxi driving and other odd jobs) working in the Columbia Engineering School and Physics Department, where some professors took me under their wing and gave me programming tasks -- in Fortran of course! -- on their early minicomputers, and encouraged me to take graduate courses. Eventually I got a graduate degree on tuition exemption, was hired at the Computer Center, and have worked here ever since, putting both of my kids through Columbia on tuition exemption too, so I can't complain. Any time between about 9:00am and 1:00pm or 2:00pm and 6:00pm, eastern time, except this Thursday afternoon I'll be at the dentist. Backus, John W., "The IBM 701 Speedcoding System", IBM, New York (10 Sep 1953), 4pp. Backus, John W., "The IBM Speedcoding System", The Journal of the Association for Computing Machinery , Vol.1 No.1 (Jan 1954), pp.4-6. Backus, John W., and Harlan Herrick, "IBM 701 Speedcoding and Other Automatic Programming Systems", Symposium on Automatic Programming for Digital Computers , Office of Technical Services, US Dept of Commerce, Washington DC (May 1954), pp.106-113. Specifications for the IBM Mathematical FORmula TRANslating System, FORTRAN , IBM Applied Science Division, New York (10 Nov 1954), 43pp. Amdahl, G.M, and J.W. Backus, The System Design of the IBM Type 704 , IBM Engineering Laboratory, Poughkeepsie NY (1955), 11pp. Backus, J.W., et al., The FORTRAN Automatic Coding System , Proceedings of the Western Joint Computing Conference 1957, pp.188-198. Backus, J.W., The Syntax and Semantics of the Proposed International Algebraic Language of Zürich ACM-GAMM Conference , Proceedings of the International Conference on Information Processing, UNESCO, 1959, pp.125-132. J.W. 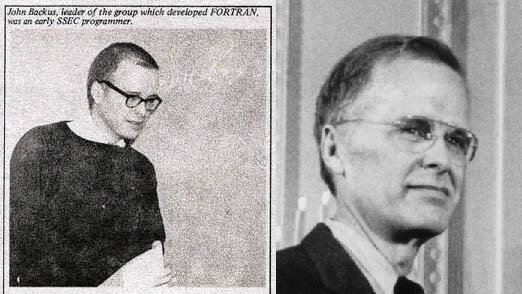 Backus, "The History of Fortran I, II, and III", Annals of the History of Computing , Vol.1 No.1 (July-September 1979). Shasha, Dennis, and Cathy Lazere, Out of Their Minds: the lives and discoveries of 15 great computer scientists , Copernicus / Springer-Verlag, New York (1995), ISBN: 0-387-97992-1. Papers of John W. Backus 1954-1994 , US Library of Congress, 2,540 items. "Preliminary Report, Programming Research Group, Applied Science Division, International Busines Machines Corporation, November 10, 1954, Specifications for The IBM Mathematical FORmula TRANslating System, FORTRAN", in Carr. John W. and Norman R. Scott, editors, Notes: Special Summer Conference on Digital Computers and Data Processors , University of Michigan, College of Engineering (Summer 1955). IBM 704 Fortran Programmer's Reference Manual (15 Oct 1956). IBM 704 Fortran Programmer's Primer (1957). IEEE Annals of the History of Computing , Special Issue, "FORTRAN's Twenty-Fifth Anniversary", vol.6 No.1 (January 1984). Ekman, Torgil, and Carl-Erik Fröberg, Introduction to Algol Programming ( Lärobok i ALGOL ), Studentlitteratur, Lund, Sweden (1964) and Oxford University Press, London (1967). John Backus Oral History Interview, Computer History Museum, September 5, 2005 (transcript). John Backus Oral History Interview, Computer History Museum, September 5, 2005 (video). ACM Turing Award citation and biography, ACM website (accessed 1 July 2018). Revised Report on the Algorithmic Language Algol 60 by J.W. Backus, P. Naur, et al. New York Times, Business Section, March 20, 2007.